I love lipstick. And not only lipstick. I love pink lipsticks. I have been hearing great things about the MAC Viva Glam Lady Gaga lipstick ($14.50) so I figured I have to visit the local MAC counter and check it out. I'm a huge Gaga fan, so I do have to confess, that was part of the reason I was intrigued. I do like the color, however it is VERY pink. Reminds me of my favorite treat, cotton candy. I now regret not swapping this one for the Viva Gaga Glam lip gloss instead of the lipstick. For some reason, I think the lip gloss can be pulled off better in this color. I do like it though, but I suggest a little gloss over it because it's a little dry, and I always need a little bit of moisture and shine. Next up, Too Faced Lip of Luxury Lipstick in "Free Love" ($20) A little more expensive then the MAC, I love the container, and I found this at Ulta, to my luck all Too Faced products were 20% off. So I thought, Why not? So the color is a little bit darker then the MAC, but still has the pink tint. Here's a side by side comparison swatch.. The MAC is on the bottom... the Too Faced is the top. I like them both, but the Too Faced is my favorite. I never thought I'd say it, but the Gaga may be a little TOO pink for me! If you're considering purchasing the Lady Gaga color, I suggest getting the lip gloss because the stick is a little too bright. I guess I should expect a loud,crazy color when the name "Lady Gaga" is on it. 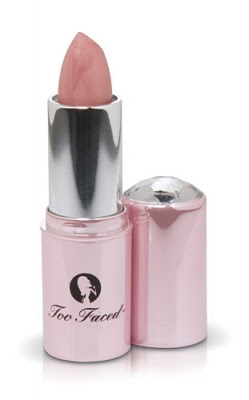 Overall, I like them both, but Too Faced comes out on top for me..